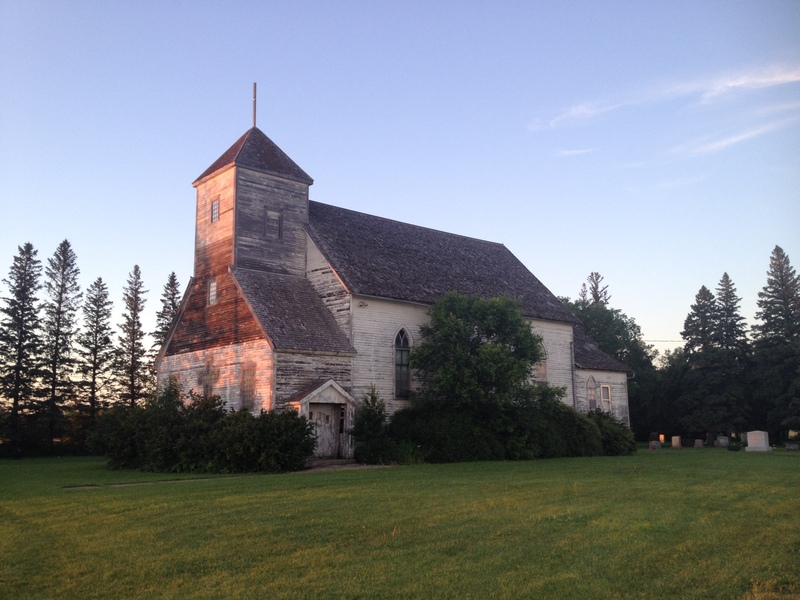 Yesterday the boys and I went to find Bethania Lutheran church outside of Perley, MN. I heard about this congregation from one of my current parishioners who grew up in Perley. Since the boys and I were already in Moorhead for some other errands, it wasn’t far to get to Bethania from there. We could see the short, weather-worn steeple of Bethania from far off as we approached on the flat country roads. The church is set far back from the gravel road and has a thin driveway leading to it surrounded by corn fields. A small cemetery sits behind the church and the cemetery grounds were mowed and looked to be well-kept. However, the church building, which closed in 1990, has since fallen into complete disrepair. Of course, I had to see if the door was unlocked and it was. The sun was setting – and granted, it was a bit ominous going in to this abandoned, empty building far off a gravel road to take pictures. I shrugged off those feelings as being merely the remnants of a few too many scary movies. Likely the only thing I had to fear was seeing a rat or perhaps falling through a rotting floorboard. The boys were totally creeped out by going inside but they also didn’t want to stay outside and be away from me in the gathering darkness. So we all crept inside to get a quick look. How the church is set up, one can’t just open the door and look in and see the altar. There are some steps right inside the doorway that go up to the level of the sanctuary. 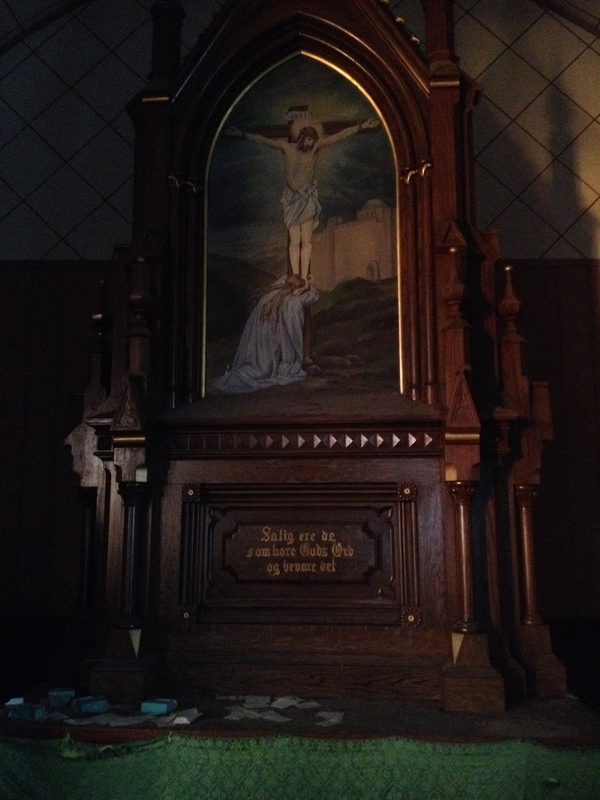 When I got to the top of the stairs, I was quite surprised to see the altar, hymnals, Bibles, chairs – so much just left behind and rotting. Someone had placed some of the chairs in a large circle with a hymnal on each open to the page of a particular evening service. Also, in the middle of the floor, a cross been constructed out of Bibles. Everywhere there were piles of trash, cloth, broken glass, and smashed relics of this church’s life. I took a picture of the whole sanctuary and then walked up close to the beautiful, relatively unscathed altar that bore a painting of Jesus on the cross and in Norwegian underneath it reads, “Blessed are those who hear God’s Word and obey it.” We were probably inside the church all of 3 minutes and didn’t even attempt to go up in the balcony or look in any side rooms. I like abandoned places but it was all really was a little too eerie to linger. We left and then took just a few more pictures outside and ran to the car with seemingly a billion mosquitos chasing us. I didn’t think much more about it. I was glad that we had found the church and I planned to go back sometime during the daylight. However, I had the most unsettling dreams last night – dreams filled with violence and rage and fear. Usually, I only have dreams like that if I eat too much pizza or nachos before bed – but last night I didn’t even eat all my calories for the day, or a drop of alcohol. And I didn’t wake up at all during the night – which is unusual for me. I slept the sleep of a dead woman and when I opened my eyes I couldn’t place what day it was or where I was for a disturbing minute. My first inclination was to go check on my children to make sure they were safe. They were. But something hung in the air. Why did I feel as though I had been visited by something dark? What had been different about the night before that was unlike any other night? 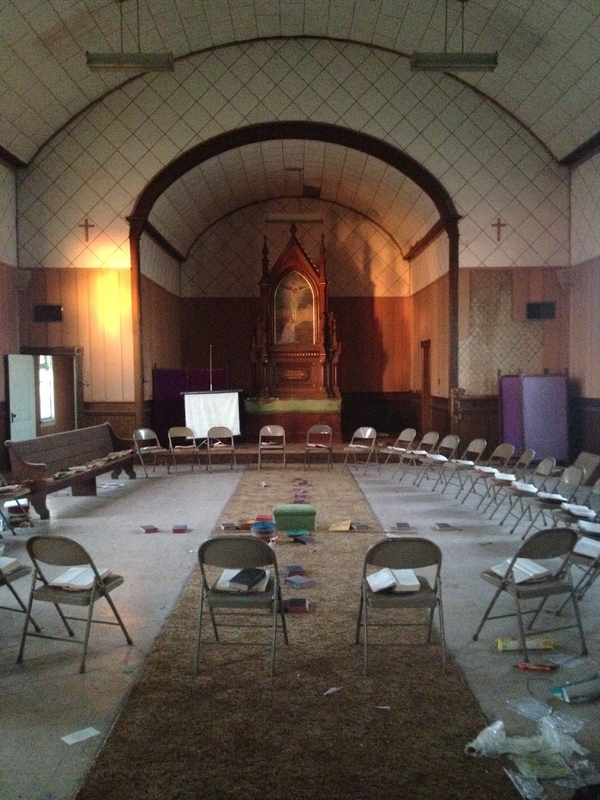 Could it be something about that church – that abandoned, sad, broken down church building and our few minutes there? The only other time I have felt this same way was long ago when my seminary friend, Lisa, and I were walking in downtown Minneapolis and we stopped in a store that sold all sorts of cool stuff – incense and icons and trinkets of all kinds. While in there, I felt the most oppressive and frightening feeling – just like there was some evil, something sinister lurking in that space. I didn’t say anything but when we left, Lisa said to me, “Did you feel that in there?” She had felt it, too! We talked about it and the only way we could describe it was to say we felt a sense of evil there. This morning, as I was thinking about all this and the dreams I had during the night – I found myself remembering what Martin Luther wrote about yelling at the darkness, “I am baptized!” when he felt tormented by temptations. It was his proclamation against any evil that might be attempting to surround him. So I quietly said the same thing in my kitchen this morning. “I am baptized. You can’t touch me, evil spirits. You have no claim over me. I know the One to whom I belong.” Perhaps it sounds dramatic? I guess that is why Lutherans don’t talk like this very often. We like to keep quiet about our demons and usually call them by other names. I’ve always been the same way – I am not one who thinks much about ghost stories or evil spirits. It’s not that I don’t believe they exist – I very much think they do exist. The Bible talks about them. One has only to turn on the news or talk with a neighbor to know evil happening everywhere in the world. Also, many of the things we wrestle with in life – depression, sadness – these are their own form of “evil” with which some of us have to wrestle and we find help through the faith and medicine. But rather than spend too much time considering evil spirits, I would rather give my energy to the things that are living and to entrust the dead to God’s care and keeping, and trust that the Holy Spirit will always be more powerful than any evil spirit. That’s what I’ve always done. In fact, it almost seems like a philosophy that was taught to me by my stoic Norwegian Lutheran parents. Don’t think or talk too much about the bad stuff, focus on the good stuff. If we don’t talk about the bad stuff maybe it will go away. It seems like we have done the same thing with thinking about evil in our world – we treat it like just a loud, troublesome vagrant on the corner who maybe if we don’t meet his eye, he will leave us alone. However, this philosophy has done so much damage to so many. Ignoring evil has never made it go away. There’s a lot that can be said about this but I won’t do that now. That will be another post. Anyway, there’s no way to say just what it was I experienced last night. Likely it was nothing more than the building stirred up a few too many memories of the Blair Witch Project. Probably it’s a perfectly peaceful place where God’s people used to gather. But I don’t think I will ever go back.